From 1 April until 30 June each PhD student has to upload and submit the annual progress report. A positively evaluated and approved progress report is a necessary prerequisite for the activation of the online re-enrolment for the Doctoral Training Programme (DTP) and the doctorate for the next academic year. REMARK: Should you wish to check the current state of your curriculum, select your DTP and click 'Print curriculum'. 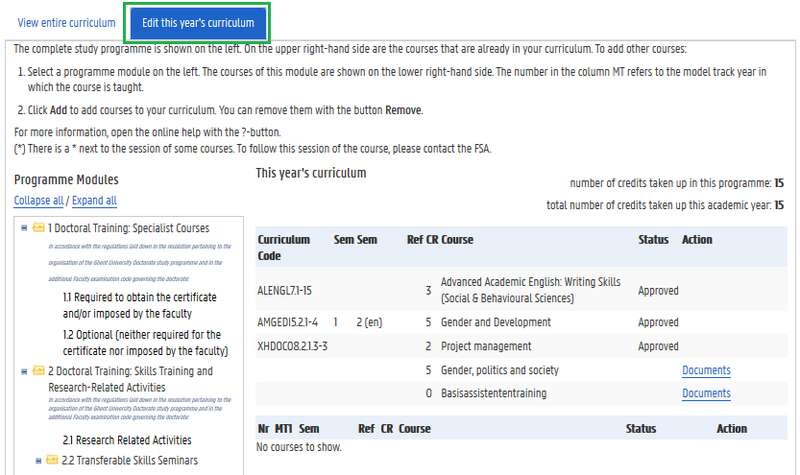 When clicking 'Curriculum' (right margin of the DTP box) you may not always get the full overview of your completed courses. (2) Check whether the status of your curriculum for the DTP is ‘Draft’ (‘Ontwerp’) and select ‘Curriculum’ (right margin). In case the status is marked differently, please contact the Doctoral Schools Office (doctoralschools@ugent.be) to change the status. Otherwise you will not be able to update your curriculum. (3) Select ‘Edit this year’s curriculum’. (4) Select the module ‘Doctoral Training: Skills Training and Research-Related Activities’, and then select ‘2.3 Annual Progress Report’ (X000002). Click the green plus sign to add the 'course' called ‘Progress Report’. (5) To add the actual progress report, first of all select ‘Documents’ in the column 'This year's curriculum'. (6) Select ‘new’, specify the type ('Progress report'), and add a title (optional). Do not forget to 'Save' this new item. (7) Click ‘Link Document’ and upload the PDF file with the actual research report. You may need to enlarge the ‘Link Document’-window that now appears. Please note that only the PDF format is allowed! You can view the added PDF by clicking 'Show'. (8) Click 'Close' and proceed to ‘View entire curriculum’ for final inspection. The status of the newly added course X000002 will be ‘Draft’ (‘Ontwerp’). The status of all previously added courses for the current academic year should be either marked as ‘Approved’ (‘Goedgekeurd’) or left undefined. (9) Save and close the pop-up screen. In order to check the current state of your curriculum, select your DTP and click the button 'Print curriculum'. REMARK: Should your curriculum be incomplete (e.g. the UGent administration still has to add a recently attended course), we advise you to postpone its submission until June (but no later than 30 June). Please note that courses attended in the current academic year can always be included during the next academic year. (10) Select the DTP and click ‘Submit for approval’. Should you wish to add a comment before submitting your curriculum, you can do so in the available comment window (optional). Please ignore the indicated amount of credits: these are not taken into account for the DTP. Then click 'Continue curriculum submission'. (11) You will notice that the status of your curriculum as well as the newly added course has changed to ‘Proposal’ (‘Voorstel’). Your supervisor and doctoral advisory committee (if appointed) will now give their advice on your progress report. You can check whether or not an advice has been added by clicking ‘History’. REMARK: If the status of your curriculum is still ‘Draft’ (‘Ontwerp’), there will be a warning indicating one of the following problems (in Dutch): (1) you submitted your progress report too early (i.e., prior to 1 April); (2) you did not add the X000002 course to your curriculum; (3) you did not add a document to the X000002 course. (12) The Doctoral Schools Office will now check your curriculum and if all requirements have been fulfilled, approve it. You will then be notified by e-mail that the status of your curriculum is ‘approved’ and that you are able to re-enrol online, simultaneously for the doctorate and the DTP, through OASIS. Please do not forget to re-enrol before 1 October. In order to re-enrol, select 'General information' > 'Enrolments' (left margin) and click 'Re-enrol'.